My Summer as a Goth is a coming-of-age story about the sometimes painful "often entertaining” search for identity and love in adolescence. After the sudden death of her father, 16-year-old, Joey Javitts is sent to stay with her eccentric grandparents while her author mother promotes her latest novel. Joey promptly falls for the beguiling Goth boy next door, Victor, and is transformed by him and his merry band of misfits in black. 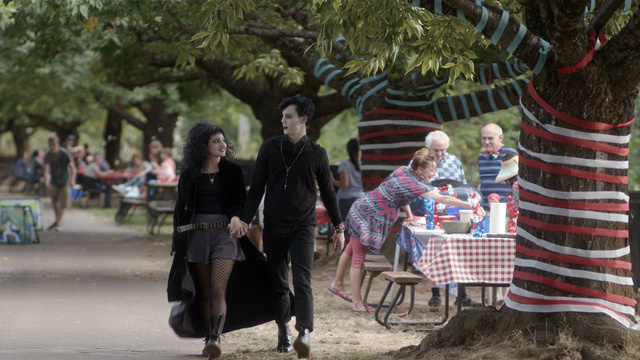 Set in present-day Portland, My Summer as a Goth navigates Joey's relationships with her new friends, her family and herself, and will resonate with anyone who survived the social alienation of adolescence and that first summer heartbreak. The story of My Summer as a Goth is inspired by the teenage misadventures of director/producer/writer Tara Johnson-Medinger and writer/producer Brandon Lee Roberts, whose friendship spans 30 years. Growing up together in Salem, Oregon ("Snailem, Snoregon"), the pair could be found hanging out downtown with fellow WOBs (Wearers-of-Black), kids who drank endless cups of coffee, chain smoked clove cigarettes and wore all black. This movie is a love letter to those kids, all grown up now but nostalgic for their glorious, misspent youth It's also for those kids' kids, still hanging out in the coffee shops and insisting on wearing all black in 90 degree summer weather.